Located on Manheim Pike, just south of Route 30. We're a few businesses down the road from the Sheetz. We’re home improvement specialists in Lancaster County. We install high-quality replacement windows and doors, roofing, premium vinyl and fiber cement siding, stone veneer, spouting, gutter protection systems, patio enclosures, and much more. We also sell and install skylights, railings, decks, retractable fabric and metal awnings, and shutters. All of the products we carry come with an extended manufacturer’s warranty and are installed by our experienced craftsmen. We are committed to providing the highest quality products and installation to homeowners and business owners. We’ve been family-owned-and-operated since 1963, and we have built our business on the belief that personalized service, quality products, and professional installations are the key to satisfying our customers. Our team is headed by George Grove Jr., who is dedicated to providing exceptional customer service. We strive to establish lasting relationships with our customers by exceeding their expectations and gaining their trust with fair prices and exceptional service. We're members of the Better Business Bureau, the Building Industry Association of Lancaster County, the National Association of Home Builders, National Association of Small Business, National Safety Council, and the Lancaster Chamber of Commerce & Industry. Visit our showroom at 1219 Manheim Pike to see the many products that can enhance the beauty and function of your home. To ask about a free in-home estimate from one of the professionals at George J. Grove & Son, call us at (717) 393-0859 or (800) 498-0859. Protect your home with strong, lightweight, and durable aluminum siding, storm doors, awnings, and more. Let us install your new aluminum siding, and say goodbye to the expense and annoyance of painting your home's exterior! Our expert window installers have lots of experience in creating the trim to go around your new windows, making them look great! Choose from a wide selection of beautiful exterior doors (including metal doors) that we'll professionally install in your home. Energy-efficient windows save you money. Our window specialists will custom-build and install your replacement windows. Whether you need to replace a single exterior door or a larger multi-door section for a deck or patio entrance, we can help! Beautify your home with an elegant glass storm door that's energy-efficient and installed the right way by our experts. We take the time to ensure your new replacement windows are properly installed right the first time. Upgrading your windows with us is a stress-free experience. Our custom replacement windows mean that they'll be a perfect fit for your house. Protect your home for years to come with a durable metal roof, professionally installed by George J. Grove & Son. Custom vinyl replacement windows are made-to-order for your home. 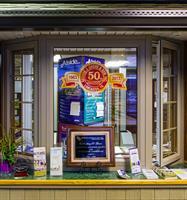 George J. Grove & Son are your replacement window experts. Your home is your most valuable investment. Protect it with professionally installed aluminum siding from George J. Grove & Son! Quality railings installed by George J. Grove aren't just a safety feature - they enhance your home's curb appeal too! Replacement windows, doors, roofs, siding, and more are professionally installed by George J. Grove & Son. Vinyl replacement windows professionally installed by George J. Grove & Son will add protection and value to your home. With quality roofing and gutter installation for your southeastern PA home, George J. Grove & Son's experts have you covered! We provide top-quality roofing to residential and commercial customers near Lancaster, PA! We're proud to have provide top-quality home improvements to our Lancaster County neighbors for more than 50 years. Stop by our Manheim Pike showroom in Lancaster and see our selection of windows, doors, siding, roofing, awnings, and more! Never paint your home's exterior again! Let our experts install new fiber cement or vinyl siding in the colors of your choice. We carry vinyl siding in a variety of modern and classic colors. 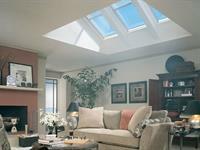 We offer custom skylight installation to bring more natural lighting into your home. Adding a new storm door is a simple way to upgrade your home. We carry and install storm doors in a variety of styles and colors. 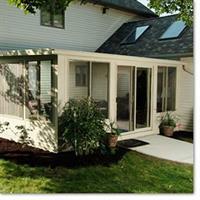 Add onto your home with a beautiful sunroom addition for more natural light with protection from the weather. Replacement windows today are much better than they used to be. They're easy to clean, look great, and save on energy costs. Windows that are properly insulated can save you energy costs. Say goodbye to drafty windows!